Under a new political skin, Ecuadorian businessman Alvaro Noboa returns to the electoral arena, but this time, his former party PRIAN he does it with a new name: Adelante Ecuatoriano Adelante, which is a modification of its discursive emblem, as he announced last August 3 at the National Electoral Council in Guayaquil. Days later, the electoral body ratified what was stated by Alvaro Noboa, the nascent organization reached 1’164.588 affiliations, an amount that allowed him to obtain the legal status and thus return to the electoral podium. 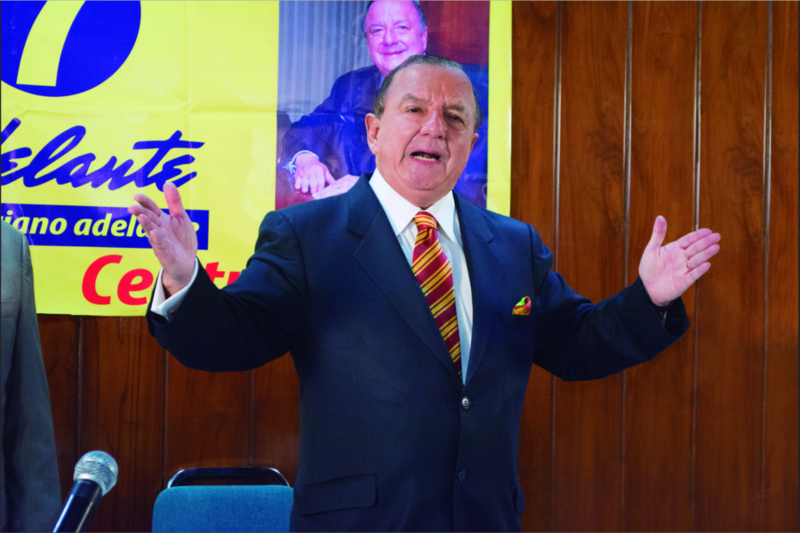 National Party leader Ecuadorian Adelante Adelante , revealed that his organization had collected more signatures, which together with the previously delivered amounted to 1’419.616 affiliations. “Although we have complied with the required number and we have officially become a political party, we continue collecting signatures, and so far we have delivered 1’164.588 affiliations to the CNE, which makes us one of the two parties with more affiliates in the country … Thanks to your massive support nationwide we have achieved that the old PRIAN now called ‘Adelante Ecuatoriano Adelante,’ represented by the list 7, becomes again the greatest party of Ecuador, as it was in 2006 when we won the first round and had a majority in the Congress,” Noboa said filled with euphoria in the Hall of Democracy. In mid-August, Labour Minister Leonardo Berrezueta pointed out that the unemployment rate in Ecuador stood at 5.3% and explained that despite a point increase -from June 2015 to June 2016,- this still remains the lowest in the region. On these statements, Noboa stressed that if all the problems currently faced by the country are added, this would lead to the conclusion that Ecuador is in crisis, so he raised some solutions. Despite the twists in the political sphere, his love for his people and his country has prevailed above all, a feeling he has demonstrated by generating more jobs through his companies. “There have been a thousand walls that have been put by those eternal politicians to not let me move forward, however, we continue building our Homeland, each day we continue generating more jobs, having become the group of companies that generates more jobs in the country, and one of the companies that has put its flag in the world,” said the Ecuadorian businessman. 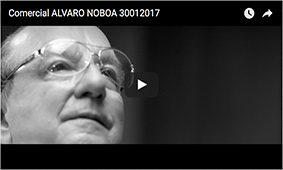 Alvaro Noboa’s speech, has not remained in simple words. On several occasions he has stated that his greatest desire is to take Ecuador out of the crisis so Ecuadorians have a better quality of life in all aspects. Without reservations, he reveals some of the proposals, which at his discretion, will allow him to fight problems such as unemployment, education, health, housing, high taxes, legal security, press freedom, corruption, ecosystem protection, among others. “The solution for those who want a renovation in the country and not the continuism is easy for an entrepreneur like me, who has become the largest employer in the country and the largest taxpayer in the country. The dollars Ecuadorians have abroad must be attracted, not by force, nothing works by force, we must attract the billions and trillions of dollars that are idle in tax havens or international banks.There´s plenty of money in the world! But in order to bring that money, there must be legal security, and those entrepreneurs have to be welcomed with open arms by the Ecuadorians, to create jobs, and generate more wealth, for both the pocket of the Ecuadorian family and the State of Ecuador. (…) Our job is to wipe out corruption, to finish with all those criminals who wanted to take over the state and today are the Ecuadorian ‘pelucones,’ the same they attacked. The businessman who works, works and works is a good man, the criminal who robs the state is a bad man, because he robs the Ecuadorian people,” Noboa said. Once the National Electoral Council approved the party led by Alvaro Noboa, the center-left leader has proceeded to meet with the leaders of several groups so he does not rule out making alliances. The party leader thanked the support received at national level and stressed he will not rest until reaching a consensus with the other candidates, so that democracy comes back to Ecuador. And although he considers himself the ideal candidate to win the upcoming elections, he says he is willing to lay down his candidacy because his aim will always be working for a better country. “If I have to sacrifice my candidacy -which I still think is the best- for a general consensus, I will, as long as there is a single candidate for the renovation; finally we will be the new Ecuador we long. (…) I will not stop fighting because I wish that this change for Ecuadorians is achieved where there is finally work for everyone, wealth, income improvements for the middle class, the working class; that bureaucracy jobs are respected for teachers, the police and the military; health, good quality education for all, that this education, which is so important, is free and for everyone, as well as housing; all these things are very important for Ecuadorians, therefore, I believe that from today until the last day of registration, we must all work together and put aside our vanity. I have a high self-esteem and I believe I am the best candidate, but Ecuador is the most important, as well as achieving a general consensus so there is a single party, that of the renovation, thus the government´s party is the continuation,” he concluded. The deadline given by the Ministry of Labour to the banana magnate Alvaro Noboa to pay outstanding values to 1,853 workers who were employees of Hacienda La Clementina, ended on August 10. The total debt for alleged dispossession and settlement, would amount to four million dollars. After the conclusion of this term, Labor Minister Leonardo Berrezueta announced the auction process of 64 assets. “We will continue with this process, we will not stop with the auction, we are in the updating stage of assets appraisal, in order to make the relevant publication to receive bids for the auction of goods,” he said during a press conference. Berrezueta said that the sale of goods and payment to the beneficiaries will be overseen by a joint committee made up of representatives of the former employees of Hacienda La Clementina, and representatives of the Ministry of Labour. Although Alvaro Noboa has publicly called for the resignation of the head of state Rafael Correa in at least seven occasions and on numerous occasions he has claimed that because of his opposition to the regime has been subject to political persecution by the government and officials on duty, the five times presidential hopeful states he does not have anything against the president. The leader of the Adelante Ecuatoriano Adelante party, is proud of his achievements and notes he will continue talking to opposition candidates, as he emphasizes that his goal is to achieve a consensus candidate and he will not rest until this happens. “Ecuadorians let us come together, this is our great opportunity to bring this country forward. I thank you once again for voting for me, for choosing me as a presidential runner. Ecuador, each day I love you more and I will continue with my life mission, which is to love God, to love my family, my loved ones, to serve all Ecuadorians, to serve through the Crusade for a New Humanity Foundation, to serve through the Luis A. Noboa Naranjo Museum, that and much more is the mission of my life and I will continue fighting to serve you. There is still no consensus which is what I want to accomplish. I have asked God to inspire all those who want the renovation, who are in the opposition and who want a change, to put aside their vanities and seek a candidate who is the one who can solve the problems of Ecuadorians,” he concluded.